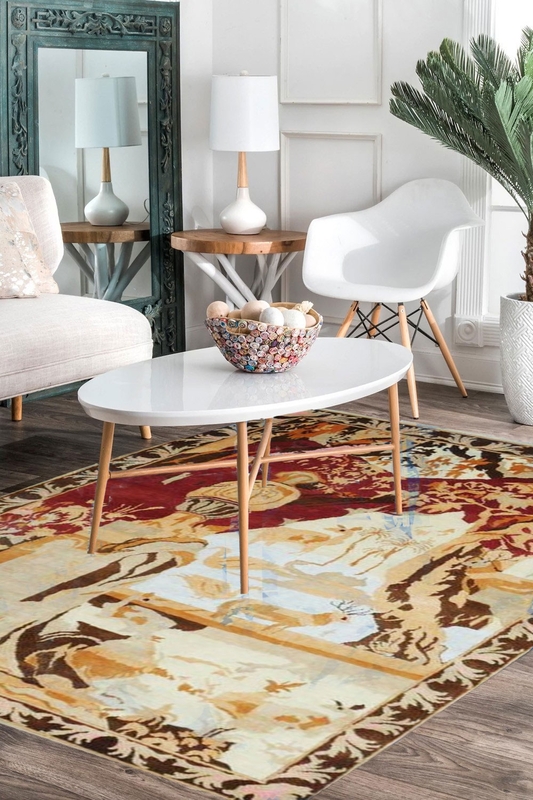 Create a focal point by adding this "One of a kind" handknotted wool modern area rug on your wall. This is a highly durable and 100% hand washable rug. It is intricately woven in India by our expert weavers. Inspired by the wildlife, this is an amazing handmade carpet which reflects the beauty in bold motifs. The ground of this carpet contains animal bold motifs, floral pattern, tress, etc. This is "One of a kind" design carpet and only available on Rugs and Beyond. The main colors are Cream, rust, white, brown. It is a beautiful modern rug and you can use this carpet for enhancing the beauty of space or for wall hanging as well. This is a medium size carpet and suitable for any place in your home.